When you're stuck with a rack full of vowels, knowing AA, AE, AI, OE and OI could save the day. By putting one of those words down, you're getting rid of 2 of your 7 vowel tiles, essentially giving you a chance at some consonants during your next draw. Sure, you could just exchange all of your letters for new ones, but what if you get 7 more vowels? You just wasted a turn for nothing—and one of your exchanges. Playing one of those 5 words ensures you can draw a few tiles, while still giving you points on the board. If including Y as a vowel, you should also memorize AY, OY, YA, YE and YO. And this concept goes both ways. If you have a rack full of consonants, you should memorize HM, MM and SH, along with BY and MY. These, unlike their two-letter vowel counterparts, can not only be used to get rid of letters, but to score big when using the word multipliers, and even bigger when playing parallels. Say for instance you have MUGWORT on the board. Your rack looks something like this: A X U U U A I. 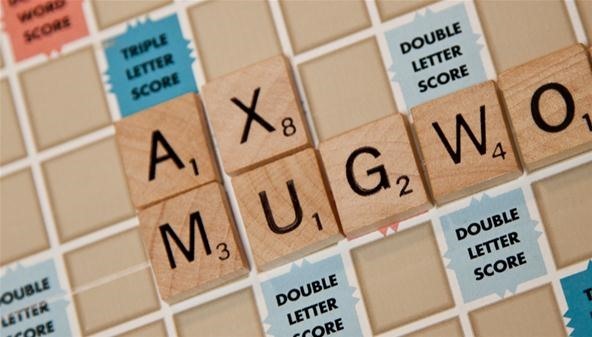 Throwing down AX parallel on the MU of MUGWORT gives you 3 words in one move (AX, AM, XU), plus the X is on a double letter score, which means you get those 8 points doubled to 16, then that's doubled to 32, which makes the whole play 38 points total. Quite a lot for just two letters. Imagine if it was on a triple letter score! Below are lists of two-letter words allowed in Scrabble and Words with Friends, since I assume a lot of you are playing on Zynga's mobile version (it does have a better interface than EA's mobile Scrabble version). Before we get to the actual list of two-letter words, you'll need to know what dictionary you'll be playing with. If you're playing Scrabble in North America, there are only 101 two-letter words that are acceptable, but anywhere else in the world, there's 124 two-letter words. 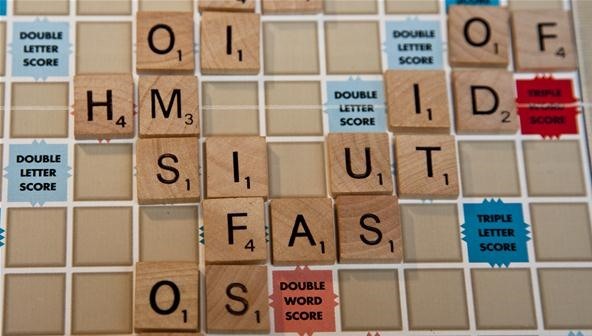 No matter if you're playing competitively in a tournament or at home with your grandmother, the list of two-letter words in Canada and the U.S. remains at 101 words. The dictionary used in North America is The Official Scrabble Players Dictionary, Fourth Edition (OSPD4) by Merriam-Webster, which provides all legal 2- to 8-letter words and their inflections with definitions. For competitive play, Scrabblers use the Official Tournament and Club Word List, Second Edition (OWL2), which omits definitions and part-of-speech labels, and includes all inflected forms spelled out in full. It adds 9-letter words and some 10-letter words, along with all of the offensive words deemed unsuitable for the family-safe OSPD4. Also, OWL2 is more commonly referred to as TWL (Tournament Word List). The OSPD4 and OWL2 are endorsed by both the NSA (National Scrabble Association) and NASPA (North American Scrabble Players Association). 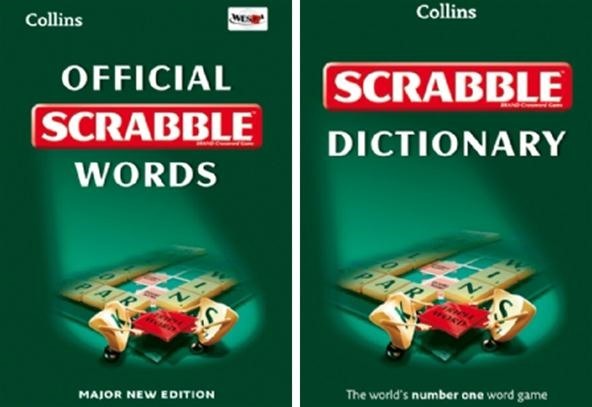 If you're playing Scrabble in the UK, Australia, India, South Africa, and so on, then your Scrabble dictionary would be the Collins Scrabble Dictionary, Third Edition. It contains all legal words in international gameplay from 2- to 9-letters long, along with definitions. There are 124 two-letter words you can use. 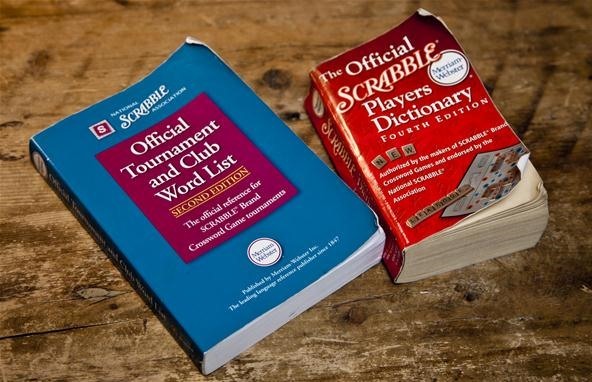 For competitive play, Scrabblers use the Collins Official Scrabble Words, Third Edition (CSW3), which like the OWL2, omits definitions and includes inflected forms spelled out in full. It lists all legal words from 2- to 15-letters long, making it a complete reference for play outside of North America. The third edition is more commonly referred to as CSW2012 or CSW12. Previously, SOWPODS was the source for all legal words in international Scrabble tournaments, which is an anagram of the two acronyms OSPD and OSW (Official Scrabble Words by Chambers). There was never an actual hard copy published of the combined word list, but now the CSW acts as a bona fide full replacement, though most still refer to it as SOWPODS. Below are all of the 101 acceptable 2-letter words from the OSPD4 and OWL2, along with all of their inflected forms. All of the definitions above come from The Official Scrabble Players Dictionary, Fourth Edition (OSPD4) by Merriam-Webster. Internationally, there are 124 acceptable 2-letter words from the CSW. All of the 101 words above are legal plays, as well as the remaining 23 listed below. All of the definitions above come from Collins Scrabble Words, Third Edition (CSW3) by Harper Collins Publishers. There were some changes to the 101 two-letter words that are shared worldwide. The OSPD4 and OWL2 remain the same, but there are some differences in the new CSW 2012. All of changes are listed below. The mobile Words with Friends game for iPhone and Android devices does not use the OSPD4, OWL2, or CSW, but instead used the ENABLE word list, which stands for Enhanced North American Benchmark LExicon. However, they are extremely flexible with adding new words. Zynga even have a place for you to recommend words. The ENABLE list reads just like the OSPD4 or OWL2 ones, but since Zynga has added additional words to Words with Friends, it looks more in-between those and the CSW. Below is just an abbreviated list of the 2-letter words accepted at this time. If I missed any, let me know. I always use QI. it's so easy and you don't need a U- and its 11 points! Yeah, that's one of my favorites, too. Also, JO, XI, XU and ZA. AX, EX, and OX are just as good. Those 8- and 10-pointers are awesome for getting out of a jam. But also could screw you in the end if you have nowhere to put them! Yeah i just won a game where I was 10 points behind then I used QI on a triple word- 33 points! Oooh, I'll have to remember XI and XU. I didn't know those were possible. A lot of these words don't really seem real to me - like, AA? That shouldn't be a word. AA is most definitely a word. It's a Hawaiian word that's transcended the Hawaiian language into an actual technical term in U.S. geology, since Hawaii is where a great deal of volcanic activity occurs (and a part of the United States). Aa is one of three basic types of flow lava, the others being pillow and pahoehoe. While on volcanology, I might add that one word 'not' in the dictionary that I think should be is vog. It's a portmanteau word that means 'volcanic smog' (smog is also a portmanteau word -- 'smoke fog').